Work has begun in earnest to restore SV Aphrodite’s original lustre. In the galley, this has meant replacing the fridge, refinishing the Corian countertops, and replacing the flooring and some cabinetry that had suffered water damage. 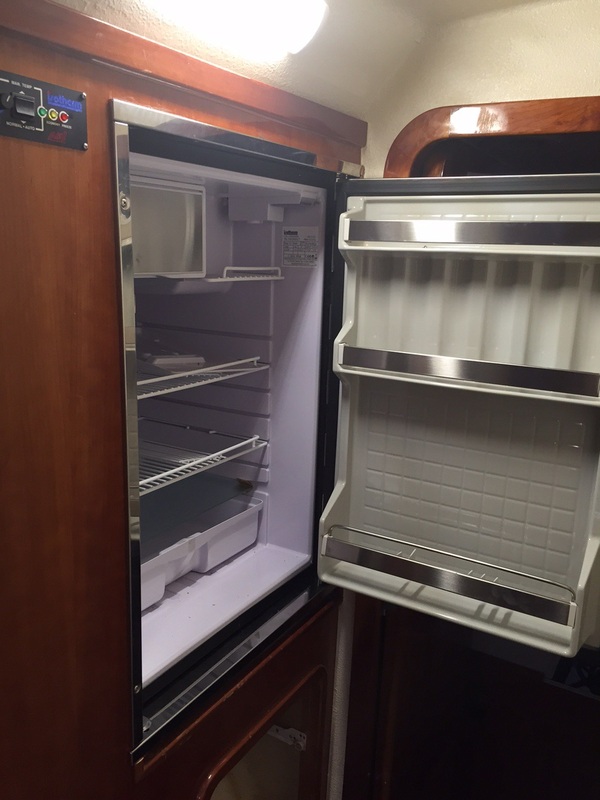 My husband took out the fridge shortly after we purchased our St Francis 50 catamaran. He discovered on a passage from Fort Lauderdale to Bradenton, Florida that the fridge was not working. Here is a picture of our newly installed fridge. Previous owners of our St Francis 50 catamaran had sailed with the hatches open in the galley. 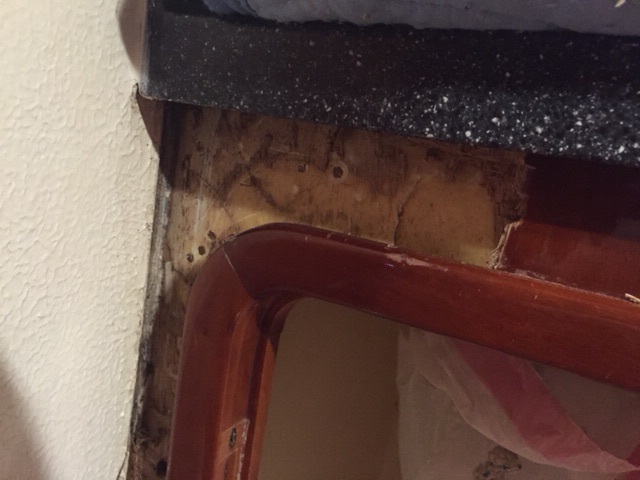 This caused water damage to the wood flooring and cabinets. The photo below shows an example of the discoloration due to flooding. Wood flooring in a galley looks nice. But, we wanted something that would stand up to the rigors of our young family. We will be replacing the galley flooring with Lonseal coin-embossed vinyl flooring. We are using the Onyx with flecks colour to co-ordinate with our charcoal grey galley countertops. 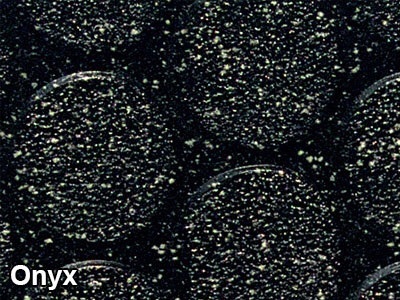 The Onyx coin-embossed flooring offers good traction and the colour is forgiving in that it won’t look dirty too quickly. Onyx looks like the sample photo below. 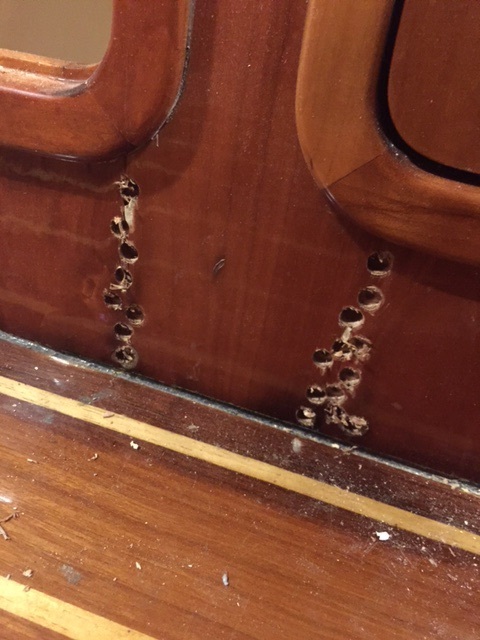 Finally, my husband’s cousin – and marine cabinetry craftsman – is drilling into our galley cabinets to locate areas of water damage. His work is bold and makes our hair stand on end. Here are some examples of what he has been doing. Drilling holes to locate wood damage and to prepare the affected areas for restoration. Having worked on Disney cruise ships previously – and we’ve seen some of his beautiful work – it seems that my husband’s cousin knows what he is doing. It looks a fright but we remind ourselves this is just the storm before the calm. Cabinet facing as it is being primed for new cherry wood. 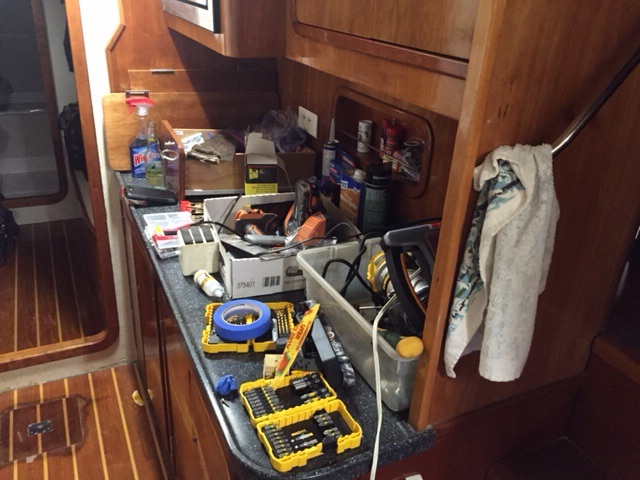 So concludes this update on the refit on the galley – part of a greater effort throughout the boat – to restore SV Aphrodite’s original sheen and performance. We are looking forward to living aboard, and sharing some photos of the finished effort. We plan to set sail on August 15th. Good for u…will b an education for all of u.!!! My dance partner and his wife did a similar sailing life up and down eastern coast of Canada and USA and the Caribbean. Everyone could not understand them not staying at home in Hamilton ; Ontario and getting a house and having children!! They also sailed across the ocean to Portugal. They did eventually come home; had their daughter and did the house scenario etc. Unfortunately; his wife died at 54 from cancer and never got to enjoy their retirement …but he always is forever grateful that they spent much of their lives in the sailing life. His wife was very brave to go along with their sailing decisions and they both had many adventures that were very exciting that many dream of but never do.It will be hard work as well and good for all of u to experience. Godspeed to all of u…pplease include us on your updates .You will have no regrets. ( I am his friend of the last 8 years and admire their courage to do the sailing life when they had youth,enthusiasm and grunt to have these memories of life at sea!!! I did this as a teen, one of three kids on the boat (other two were 4 and 10). The parents were also relatively new to long distance, open water sailing and so had help on the more difficult legs. I was the nanny and helped with the home schooling. We encountered some pretty bad weather, which was very stressful at the time, ran out of fuel in the doldrums, and generally had a great time. It was a wonderful experience for everyone, but there was a pretty steep learning curve the first six months…. Good luck! Love your blog, enjoy reading so much, thanks!